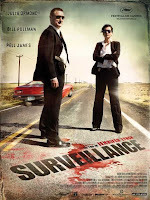 Surveillance is a disturbing time-warped thriller blending suspense, horror and a little black comedy, that has all the visible hallmarks of its director – Jennifer Lynch, daughter of Twin Peaks and MulHolland Dr creator – David Lynch. While her last mainstream effort 15 years ago – Boxing Helena starring the beautiful Sherilyn Fenn was a bizarre love story that flopped, Surveillance is a top notch return to form that should fetch her good work. A serial killer-on-the-loose whodunit set in the scenic Santa Fe desert which mixes twisted cops, suave FBI agents and some great photography to good measure, Surveillance has a fairly long-winded plot that left me clueless where this was heading but it all soon connects and your patience is rewarded with a satisfying climax that actually surprised me. A 2008 Cannes Film Festival entry with Bill Pullman, Julia Ormond and Michael Ironside for company, this is 97 minutes of time very well spent. Highly recommended. Single Link 700 MB Avi Download - Cut, copy and paste into your browser. thanks for the link. If you pay attention, you know what the truth is but i think it wasdone intentionally. LOVED this film! Creepy, effective and loved Pullman and Ormond's chemistry. Very fine film!